Real-time moving map shows current aircraft position, taxiways, gates, navaids, airways with integrated flight planning optionally on street or satellite map. Keep the left mouse button pressed to scroll around on the map. Of course, also the corresponding touch gesture is supported. You can use your mouse wheel to zoom in and out. Again also the two finger multi-touch zoom gesture is supported. If you keep the CTRL key pressed and then select an area, you can zoom to exactly this area. Additional an important control action is the right click or long touch for touch screens: You can use that to trigger several actions on many elements on the map (see also Pop-Up Menu). In the following all control elements will be explained individually. The buttons on the left side of the map toggle the display of various map layer whereas the buttons on the right side can be used to perform different actions. If a button is displayed in white this layer or action is currently inactive. A orange color shows a partly active layer or action. This mean for example that the structure of a layer (like a runway) is displayed, but not a corresponding text (like the runway ident). Note: Not all layers and actions have a partly active state. And if the button is in green this layer or action is currently active. User toggles the display of the user aircraft. In partly active state only the aircraft itself is displayed and in full active state additionally the current altitude as flight level as well as the indicated airspeed and true heading direction separated with a T is displayed. AI Aircraft toggle the display of AI aircraft generated by flight simulator. In partly active state only the AI aircraft themselves are displayed and in full active state additionally the AI aircraft type, the current altitude as flight level as well as the indicated airspeed and true heading direction separated with a T is displayed. Note: Please keep in mind that flight simulator only simulates AI aircraft about 70-100 NM around the user aircraft. Therefore no AI aircraft will be displayed on the map outside of this area. VATSIM toggle the display of pilot and ATC users of the VATSIM (Virtual Air Traffic Simulation) network. In partly active state only the VATSIM users themselves are displayed and in full active state additionally some textual information about the user next to it. Hovering with the mouse cursor over this button will show the time of the last update. IVAO toggle the display of pilot and ATC users of the IVAO (International Virtual Aviation Organization) network. In partly active state only the IVAO users themselves are displayed and in full active state additionally some textual information about the user next to it. Hovering with the mouse cursor over this button will show the time of the last update. PilotEdge toggle the display of pilot users of the PilotEdge network. In partly active state only the PilotEdge users themselves are displayed and in full active state additionally some textual information about the user next to it. Hovering with the mouse cursor over this button will show the time of the last update. Note: VATSIM and IVAO cannot be combined with the button AI Aircraft, but PilotEdge can. For the latter AI Aircraft toggles the display of PilotEdge drone aircraft. Airport toggles the display of the airport symbols. In partly active state only the airport symbols themselves are displayed and in full active state additionally the airport ICAO code. Runway toggles the rendering of the runway surfaces. In partly active state only the runway surfaces themselves are displayed and in full active state additionally the runway idents on both sides of the runways. ILS toggles the rendering of the ILS beams. In partly active state only the ILS beams themselves are displayed and in full active state additionally the ILS idents. Axis toggles the rendering of the runway axes - a dotted line from the runway start. There is no partly active state available for this layer. Marker toggles the display of the marker symbols. In partly active state only the marker symbols themselves are displayed and in full active state additionally the marker types (outer marker (OM), middle marker (MM), inner marker (IM), back course marker (BC)). Taxi/Park toggles the display of the taxiway, apron and park area surfaces. In partly active state only the surfaces themselves are displayed and in full active state additionally the taxi point and parking names. VOR/DME toggles the display of the VOR/DME symbols. In partly active state only the VOR/DME symbols themselves are displayed and in full active state additionally the VOR/DME idents. NDB toggles the display of the NDB symbols. In partly active state only the NDB symbols themselves are displayed and in full active state additionally the NDB idents. Airspace toggles the display of airspace boundaries. In partly active state only the airspace boundaries themselves are displayed and in full active state additionally the airspace names. Airway High toggles the display of high (jet) airways together with their connecting waypoints. In partly active state only the airways and waypoints themselves are displayed and in full active state additionally the airway names and waypoint idents. Airway Low toggles the display of low (victor) airways together with their connecting waypoints. In partly active state only the airways and waypoints themselves are displayed and in full active state additionally the airway names and waypoint idents. Waypoint toggles the display of all waypoints including waypoints not connected to any airways. In partly active state only the waypoints themselves are displayed and in full active state additionally the waypoint idents. Weather Station toggles the display of weather stations. In partly active state only the weather stations themselves are displayed and in full active state additionally the weather station ICAO codes. User POI toggles the display of user points of interest (POI). In partly active state only the points of interest themselves are displayed and in full active state additionally the points of interest names. If no background type is selected the map is displayed on a plain surface colored in black. Street Map switches the map background to a street map. Satellite Map switches the map background to a satellite map. Height Map switches the map background to a height map which displays the ground level elevation. Find Object shows the Find Object dialog. Flight Plan Mode enables or disables the flight plan mode. This dialog is displayed as long as the flight plan mode is enabled. The displayed flight plan tables has the same functionality as on the Flight Plan module. 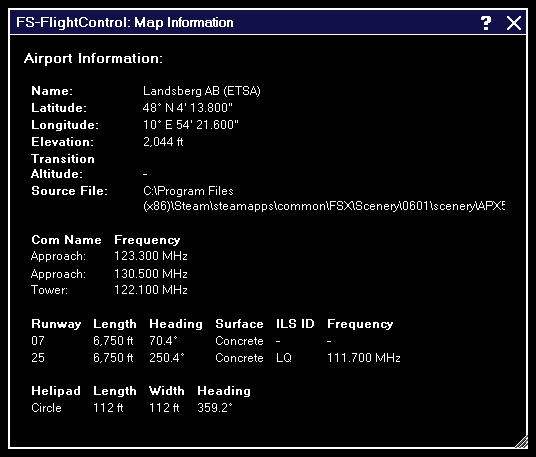 Only as long as the Flight Plan Mode is enabled flight planning functions are shown in the Pop-Up Menu. You can for example right-click on any waypoint on the map and easily add it to your flight plan. Auto Zoom enables or disables the automatic zoom based on the current aircraft altitude above ground. Note: The automatic zoom feature can be configured on the Settings module. Zoom + zooms in and Zoom - zooms out. Center Aircraft centers the map on the current aircraft position. Trace Aircraft enables or disables the drawing of an aircraft trace line. Repositon Aircraft allows you to quickly reposition the aircraft. 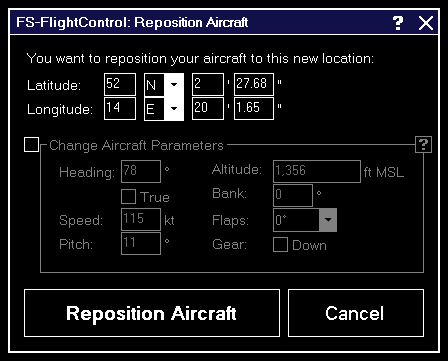 After this action is activated the next click on the map will open the reposition aircraft dialog below. To cancel the repositioning action again just click a second time on this button. After you initiated an aircraft repositioning this dialog is displayed. First you can change the new location (latitude and longitude) manually if you want. To change the other parameters just enable the Change Aircraft Parameters checkbox. All other aircraft parameters like heading, altitude, speed, pitch and bank angle are pre-filled with the current aircraft values. Weather Info toggles the display of a wind arrow in the top center of the map. In partly active state only the wind arrow itself is displayed and in full active state additionally the current wind speed and true direction separated with a T as well as the visibility range and temperature are displayed. Measure allows you to quickly measure the distance between two points on the map. After this action is activated first click on the start and then on the end point. Now the distance between these two points together with the true heading from the first to the second point is displayed. Compass Rose toggles the display of a compass rose around the aircraft. Print Map allows you to print the current map view. Note: You can define the used printer in the Settings module; same goes for the used color schema used for printing. After you right-clicked (long touch) on any point of the map this pop-up menu will open. 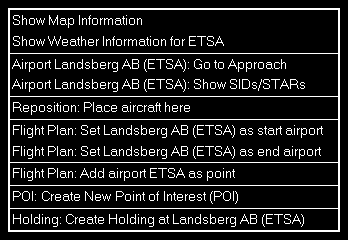 The displayed menu items depend on the location where you right-clicked, the activated layers and if the Flight Plan Mode is active or not. Using the menu item Show Map Information will open this pop-up window showing detailed information about all nearby facilities. You can create a new point of interest (POI) at any map location. Just enter a name for it here and if you want you can also change the exact location manually. This point can later be used for example as a flight plan point. 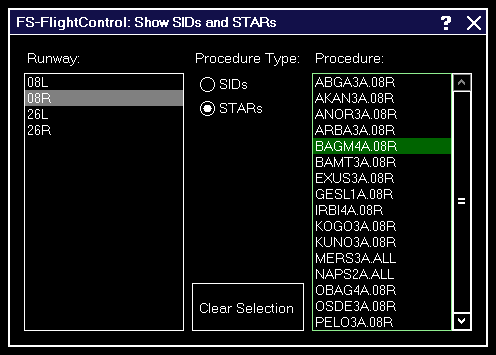 Show any Standard Instrument Departure (SID) or Standard Terminal Arrival Route (STAR) procedure on the map. Therefore first select the corresponding runway, then the type of the procedure you want to see and finally the procedure itself. Afterwards the procedure selected is immediately displayed on the map. To remove the displayed procedure from the map again, use the button Clear Selection. In the footer of the map some additional information can be displayed. You can choose what is displayed there in the Settings module. In the bottom left of the map the current mouse cursor position can be displayed. In the bottom center of the map the current frames per second can be displayed. In the bottom right of the map you can always see the current map scale. In the following all icons used on the map are explained. 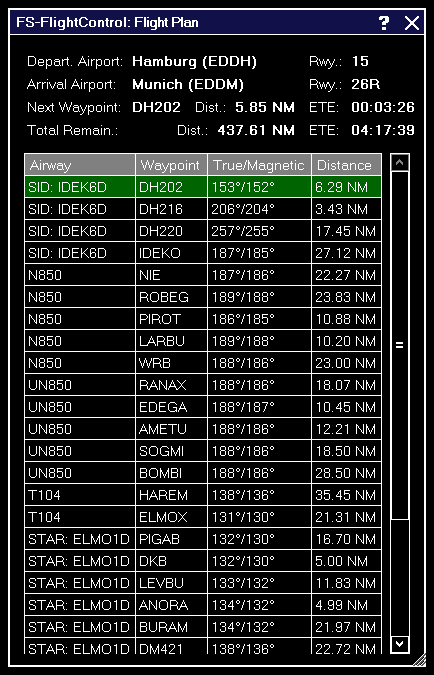 This shows a NDB (Non-Directional Beacon). This shows a VOR (VHF Omnidirectional Radio Range). And this a VOR that includes a DME (Distance Measuring Equipment). This shows a DME only. This shows a TACAN (Tactical Air Navigation).